After rebounding from upper target level, Eurodollar started moving downwards. Most likely, after completing local correction, pair will continue falling down towards closest group of fibo-levels. If market rebounds from them, pair may start new correction. Current correction is quite unlikely to be very deep; main target is at 23.6%. If price rebounds from it, I’ll increase my short position. According to analysis of temporary fibo-zones, lower targets may be reached by the middle of this week. Franc is also being corrected, but may yet continue growing up. It looks like bulls may reach level of 0.9120 during the next several hours. However, if market rebounds from upper fibo-levels, price may start new correction. At H1 chart, price is expected to finish current correction at level of 23.6%. If pair rebounds from this level, I’ll open one more buy order. 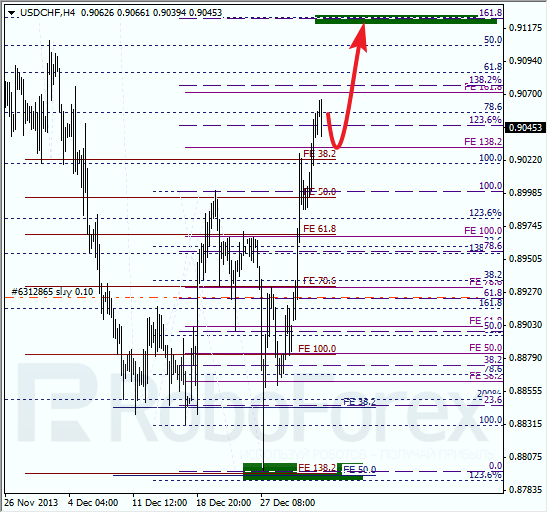 According to analysis of temporary fibo-zones, predicted target levels may be reached by Wednesday.